The carbon stored in the tropical forests of Southeast Asia is extremely valuable—but how much is it worth? 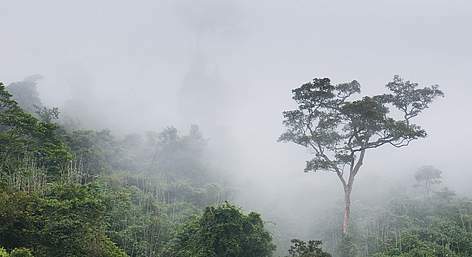 WWF's Reducing Emissions from Deforestation and Forest Degradation (REDD+) projects in the Greater Mekong region aim to put a value on the carbon stored in forests in order to better protect their biodiversity and ecosystem services. Deforestation and forest degradation are estimated to make up around 18% of global greenhouse gas emissions, especially in carbon-rich tropical forests. This is why WWF's REDD+ projects aim to build sustainable financing mechanisms that will protect some of the most important forest habitats left on Earth. At its core, REDD+ is an international policy mechanism whereby benefits flow from industrialized countries to forest-rich countries in exchange for avoided deforestation and forest degradation. This system aims to change the incentives—to make tropical forests more valuable standing than felled, to increase the security and sustainability of local livelihoods, to protect forest biodiversity and to dramatically decrease greenhouse gas emissions from tropical deforestation and degradation. 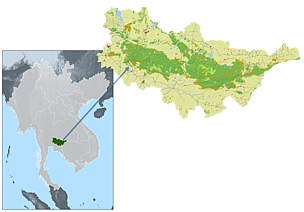 How does WWF do REDD+ in the Greater Mekong region? In order to manage the risks associated with this ambitious and dynamic REDD+ system, WWF has agreed on specific guiding principles (see box on the right) with CARE and Greenpeace. A transboundary project between Laos and Vietnam, the "CarBi" project targets the avoidance of deforestation and forest degradation in the border area of southern Lao PDR and central Vietnam, to protect carbon sinks and biodiversity. The CarBi project will improve Protected Area management in over 200 000 hectares of priority biodiversity land. It will also bring Laos and Vietnam together to address trans-boundary timber trade, including the development of a progressive timber tracking system to address the chain of custody. The project will support livelihood enhancement in both countries, including forest restoration in Vietnam. Under CarBi’s REDD+ Component, WWF will assess the feasibility of a joint transboundary project design across border areas, support efforts to measure, report and verify (MRV) carbon emissions from forests and provide capacity building to project partners to ensure long-term sustainability. TREEMAPS will facilitate the development of a high-resolution, nation-wide forest carbon base map and a REDD+ project design document (PDD) in a pilot site in the Dong Phayayen-Khao Yai Forest Complex. 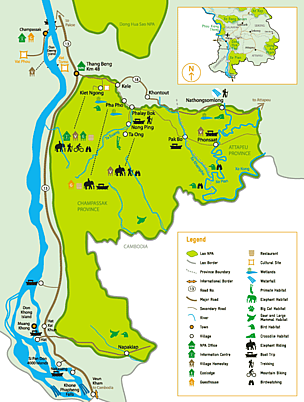 The Xe Pian National Park REDD+ project intends to protect one of Lao’s biodiversity hotspots, by creating a sustainable financing loop to fund increased law enforcement, patrolling, land use planning, and reforestation within the park. Xe Pian is a natural complex of unique habitats, including wetlands with large water birds and areas of lowland forest hosting large mammals.